An HSV color wheel allows the user to quickly select a multitude of colors. A color wheel is a circular chart that shows primary and secondary colors. The color wheel most commonly used today is called the HSV color wheel which means hue, saturation, value. The digital form of the HSV color wheel is called the RGB color wheel (shown below). 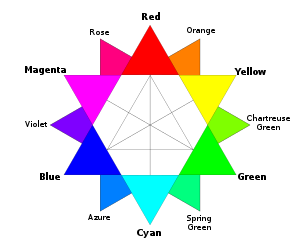 The HSV/RGB color wheel is described below. There are two versions: one in which red, green and blue are regarded as the primary colors (called the electronic or computer color wheel); and one in which magenta, yellow, and cyan are regarded as the primary colors (called the printer's color wheel). (* Primary means first) In the electronic color wheel used for electronic devices such as televisions and computers, red, green, and blue are regarded as the primary colors and magenta, yellow, and cyan are regarded as the secondary colors. The primary colors always appear on the color wheel. There are the three primary colors of light. These are called the three additive colors. They are red (made in pigment by mixing yellow and magenta), green (made in pigment by mixing cyan and yellow), and blue (made in pigment by mixing magenta and cyan). The three primary colors of light are the secondary colors on the printer's color wheel. The primary colors of light can be mixed together to make secondary colors. A long time ago, people used to think that the primary colors were red, yellow and blue. Now we know they were wrong. (* Secondary means second) The secondary colors are on all color wheels. Secondary colors are made by mixing the primary colors of light together. The secondary colors of light are the primary colors of pigment on the printer's color wheel--the color wheel used for color printing). These three colors are called the subtractive colors. They are magenta (a bright pink), yellow and cyan (a light greenish blue). The primary colors of light are the secondary colors on the "printer's color wheel". The three primary colors of pigment can be mixed to make red (magenta and yellow), green (yellow and cyan), and blue (cyan and magenta), but they do not appear as bright when they are made with pigment instead of light. The secondary colors can be mixed with the primary colors to make tertiary colors. (* Tertiary means third) The tertiary colors are made by mixing a secondary and primary color together. The tertiary colors are orange, made by mixing red and yellow; chartreuse green (yellow-green), made by mixing green and yellow; spring green, made by mixing green and cyan; azure, made by mixing blue and cyan; violet, made by mixing blue and magenta; and rose, made by mixing red and magenta. The tertiary colors are the same for both the printer's color wheel and the electronic color wheel. The 12 major colors of the color wheel, at 30 degree intervals on the HSV color wheel (shown above), are the following: red (0 degrees or 360 degrees), orange (30 degrees), yellow (60 degrees), chartreuse Red Light (10 degrees), green (120 degrees), spring green (150 degrees), cyan (180 degrees), azure (210 degrees), blue (240 degrees), violet (270 degrees), magenta (300 degrees), and rose (330 degrees). This constitutes the complete set of primary, secondary, and tertiary color names. Note: Red is shown twice so it can be compared to both orange and rose. On the traditional red-yellow-blue pigment color wheel (in which red, yellow, and blue were regarded as the primary colors and orange, green, and violet were regarded as the secondary colors), the tertiary colors on a red-yellow-blue (RYB) color wheel were called red-violet, blue-violet, blue-green, yellow-green, yellow-orange, and red-orange. This page was last changed on 17 April 2019, at 02:51.